When I was little, I had a rocking horse named Sam. I loved him, or so I'm told. I think Trav loved him too. So when I saw this little rocking horse (minus Sam's finger pinching aluminum springs) I couldn't pass it up. 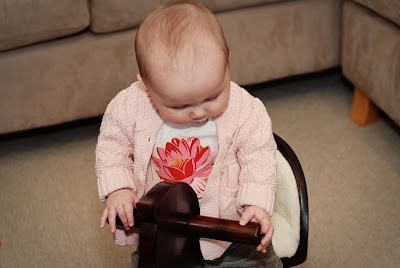 Ella was a little hesitant at first, but if you put her right in the middle of the seat she can rock back and forth. That's so much fun. I had a finger pinching rocking horse too and I loved it as well. I'm glad Ella's is much safer. Ryan also had a rocking horse like yours. I think we kept it at Grandmas. Sarah and Ryan loved taking turns on it. Little Ella's is pretty cute......of course, not as cute as she is! The Wilson's still have the toy pony you gave Trav for his first birthday...its so cute.